In 1958, and again in 1962, William Branham said that man would never make it to the moon. This statement is contrary to documented history. 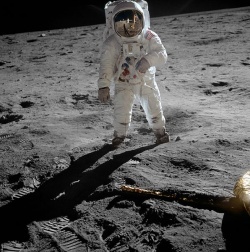 Astronaut Buzz Aldrin on the moon in 1969. What's the meaning of these sputniks in the skies? What's the matter? What is this modern Babylon that we're trying to build a machine to take us to the moon? You'll never make it. Oh, now they're all wanting to make a whole lot of these astronaut cans so they can get into it. And the--the atomic age comes, they're going to bust up the world; they just pull this and all go over on the moon, taking a trip to the moon, and have it all over with, and so they'll just make them another economy on the moon. They ain't going to get there. Look what, all the brag of the communists, somebody trying to get somebody to the moon. God is trying to get somebody to Heaven. See? But look how they're spending millions and billions and trillions of dollars, in a wasted effort. When they get there, they ain't going to find nothing. What's the matter with them? In September 1959, the Soviet Union's unmanned Luna 2 Mission reached the moon. On July 1969, after William Branham's passing, Neil Armstrong and Buzz Aldrin landed the United State's Apollo 11 on the surface of the moon. Only twelve men have ever landed on the moon. No communist country has yet landed a man on the moon. Some followers of William Branham resort to conspiracy theories to explain that William Branham's prophecy is correct, believing instead that the moon landing was a hoax perpetrated by NASA, and that man never landed on the moon. This is a result of cognitive dissonance, where an individual will look for excuses to ignore facts that highlight a real issue. This page was last edited on 22 August 2015, at 03:46.